After a short break I'm back to business. What they say is true: "having one baby is some work, having two babies is not double the work, but more like 4 times the work" ;-) It's nice to spend time with family, but I also enjoy starting to work again. Some people might not understand that, but I guess I'm lucky I enjoy the things I do. Find the right balance is the real challenge for me. Oracle Open World (OOW) 2009 is not far off and just as previous years there will be many APEX sessions. I'm sure David Peake will list them all in his APEX Conference Session application soon. On the Sunday there will be a special APEX day. It will be a joint user group event (IOUG and ODTUG). Scott Spendolini and myself are hosting it. 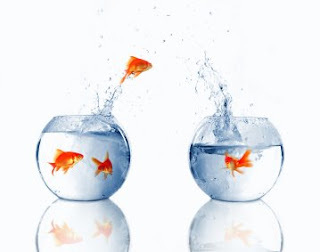 The theme we came up with is "Migrations to APEX" where we have some nice case studies from people migrating from different platforms to Oracle Application Express. At the end of the day we also have the "Ask the Experts" panel. I look forward to OOW already as it will be nice to see the people I missed at ODTUG. I also wonder what Larry has to announce this time. See you at San Francisco. We had to wait for some time, but yesterday she finally agreed to come out of the save environment of mummies tummy and have a look at this world. Emmeline got born on the 16th of July at 17.40h. She's a bit smaller than her brother; her weight is 2755 gram and she has a length of 47 cm. 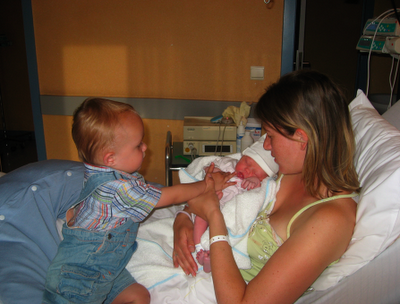 On the picture you see mummy, our son Matthias and our few hours old daughter Emmeline. Mummy and Emmeline are doing great. For Matthias everything is a bit strange but he's handling it very well so far. 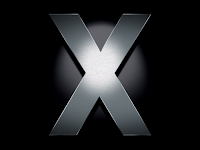 Sometimes I get the question which Mac OSX software I use. So here's a list of programs I've installed. Some I use often others less often. If you use other nice software, feel free to add! For the people who want to work faster, here's a good list of shortcuts for OSX. 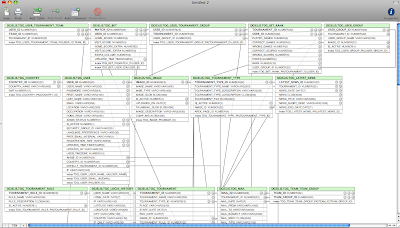 Louis-Guillaume Carrier-Bédard commented on my previous post about SQL Modeler for Mac OSX, that I had to check out a tool called Power*Architect. So now I wanted to get an ERD of some tables, so you run Power*Architect and select from which Data Source you want to capture. As far as I've tested Power*Architect, it looks very promising. It's definitely a tool I will try a bit more in the future. 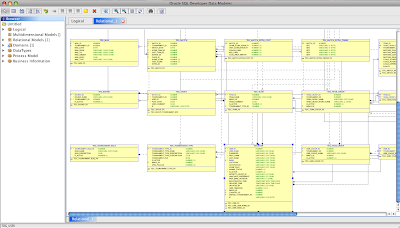 On the first of July Oracle's SQL Developer Data Modeler got a production release. You have the choice between a full version and a Viewer only version. You'll see a folder called "datamodeler"
As expected Oracle didn't make the tool for free. I hoped differently, but apparently Larry decided against it. The latest Oracle pricelist shows under the Tools section the price of SQL Developer Data Modeler. The first year you pay USD 3,000 + USD 660 (support and upgrade), from the second year onwards it's 660, but that gives you the right to install all updates. I definitely think the product can justify the price, but maybe not for everybody or in every project as you might not want to use all the features. One of the most important parts for me is viewing the ERD in a graphical way. I tend to use the ERD to explain clients how we see the application. Or if we come in when the application already exist, to quickly know what is going on behind the scenes. Till now I used SQLEditor of MalcolmHardie Solutions. It allows me to connect to a database and get the ERD for a schema or certain tables. It can do a lot more like adding tables, columns etc and you can see the sql statements in different formats. 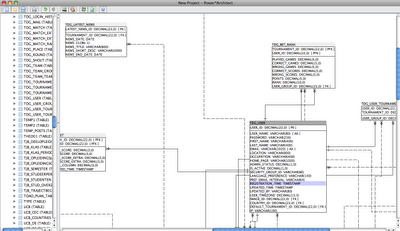 Below is a screenshot of the same schema as the picture before. Most of the time I have to rearrange the tables so it's more logic and more understandable. Personally I think Oracle SQL Developer Data Modeler looks a bit better and it has more features and I had to not rearrange that much as with SQLEditor. But then I guess that explains the difference in price ;-) SQLEditor costs $79. I still have a lot to learn of the functionalities of Oracle SQL Developer Data Modeler, but what I saw at the conferences and what I could do so far, I definitely think it's worth for you to give it a try.